To submit a proposal you must either login or register. A week-long course is offered to students and early researchers and students from Middle East countries which are SESAME members, providing practical training in macromolecular crystallography, bioSAXS and other structure determination methods. Instruct-ERIC offers open access to structural biology infrastructure at our Instruct Centres. Our aim is to facilitate excellent science, and to this end, all applications are submitted for peer review by a panel of experts. 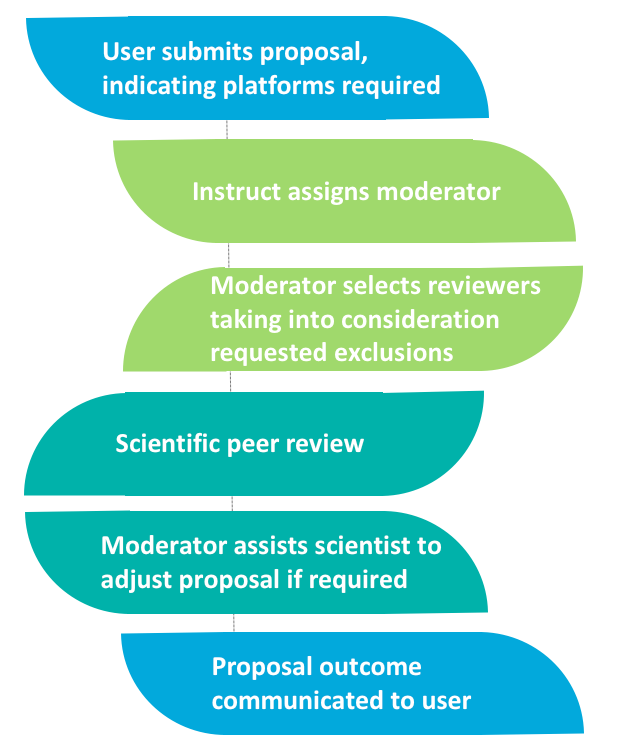 Proposal funding is approved based on scientific merit, and reviewers offer constructive advice for improvements where this would benefit the research proposal. Timeframe: The application and review process is efficient, transparent and quick. We aim to turn around applications within 6 weeks. When to apply: Applications for access can be submitted at any time. Periodically, special calls for access will be published with a defined deadline. These special calls carry specific criteria, so please read the calls carefully. Proposal application steps: There are six steps to the online application process, and you are guided through them step by step. Integrative structural biology: Instruct advocates integrative structural biology, where multiple techniques give particular breadth to research, although we are happy to accept proposals for both single or multiple technologies. Funding: Instruct-ERIC can fund the consumables, travel and accommodation for access visits. For more information on what Instruct-ERIC pays for, consult Funding for Access. Who qualifies: Academic and commercial scientists from Instruct Member Countries can apply for fully funded access. More information on who can apply. Your ARIA profile: Remember to update your profile, since this acts as your CV for all online applications. You can edit your profile at the end of your dashboard page. More information: Download the proposal submission user guide, access policy or contact us.